SPRING, Texas -- A little boy was dropped off at a stranger's front door and abandoned by a woman who ran away. Deputies with the Montgomery County Sheriff's Office are investigating after a woman found the toddler left at her door in the 30700 block of Legends Ridge Drive around 8:20 p.m. Wednesday. The woman called 911 and said that she heard a knock at her door and when she went to answer the door she found a 2-year-old black male child standing there, with no adult. The resident showed deputies surveillance video that showed a woman arrive at the home in a white passenger car. The suspect could be seen running toward the front door of the home while lifting the child in the air by one arm. Once the woman gets to the front door she rings the doorbell, knocks on the door and then runs back to her vehicle, abandoning the 2-year-old child and two bags she was carrying. The entire incident lasted 23 seconds. The suspect is described by authorities as a black woman who appears to be in her mid-20's to early 30's with long hair reaching below her waist. She has multiple tattoos on her right arm that can be seen in the video. At this point the identity of the suspect and the child are unknown. The child is not hurt and appears to be in good health. Child Protective Services were called to the scene and took custody of the child and are working to identify his family. If anyone has any information regarding the child or suspect, please contact the Montgomery County Sheriff's Office 936-760-5800 or contact Multi-County Crime Stoppers at 1-800-392-STOP (7867) and refer to case# 18A299244. 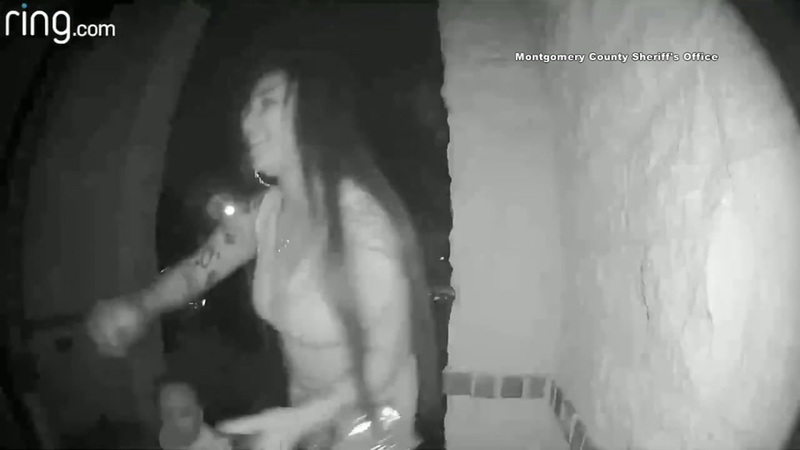 Neighbors concerned about video showing woman who rang doorbell and disappeared in Montgomery Co. She appears to be wearing restraints on her hands.